While Tony Abbot calls John Howard his mentor, it’s worth considering the impact on the Abbott universe of another political warrior whose profile was always instantly recognisable. The warrior’s hair was perfect as a helmet, the head and body usually leant forward when walking or still, the eyes and nose ever-alert to detect political peril or party advantage— and always the handbag that doubled as sceptre. Step forward Margaret Thatcher, with some words of wisdom for the Abbott government, via her two memoirs and her book on international strategy, Statecraft (which Mrs T said could just as easily be called Power). Thatcher figured in this column last month  as the winner of our annual award for the use of symbol, stunt, prop, gesture or jest in international affairs. Turn to her now for some help in mapping the mind and underlying assumptions of Australia’s Prime Minister. In understanding that mental universe, it’s probably as useful to read Thatcher’s memoirs or John Howard’s Lazarus Rising  as it is to read Abbott’s manifesto, Battlelines . 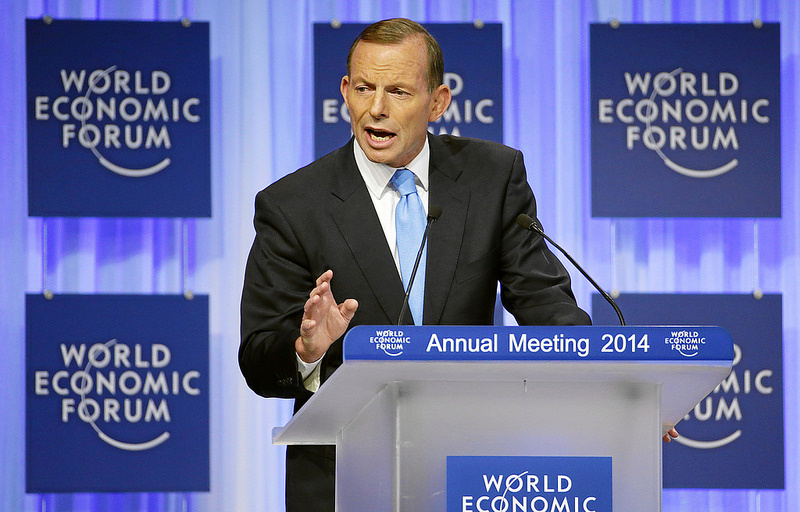 Abbott has taken a bit of stick  for the simplicity of the messages he imparted  to the annual elite-fest in Davos. Bromides always matter, however, because they tend to be statements of base beliefs. Put on the Thatcherite glasses and Abbott’s statement-in-the-snow shifts from clichés to verities. You can almost hear Mrs T’s voice delivering Abbott’s thoughts on freer trade and smaller government and empowered citizens: ‘You can’t spend what you haven’t got. No country has ever taxed or subsidised its way to prosperity’. And there was a certain Thatcher flavour in Abbott proclaiming that the G20 summit he will chair this year must be all about trade and not a talkfest. So, drawing on Thatcher’s three tomes, here are some thoughts from Chairman Maggie that might help the Prime Minister— or assist the rest of us to see where he might be going. Thatcher’s Law: A version of ‘events, dear boy, events’, Thatcher’s Law is simplicity itself: The unexpected happens. The real test is how you cope. She links this to her rendering of Rumsfeld’s  known knowns, known unknowns and unknown unknowns. The Thatcher version: ‘It is always important in matters of high politics to know what you do not know. Those who think they know, but are mistaken, and act upon their mistakes, are the most dangerous people to have in charge’. The United States: ‘America alone has the moral as well as the material capacity for world leadership … America’s closest allies, particularly her allies in the English-speaking world, must regard America’s mission as encompassing their own.’ This is the territory ASPI touched on  in ‘Keep calm and carry on: Reflections on the Anglosphere’. It’s part of the context for Foreign Minister Julie Bishop’s twin US speeches  about America as Oz’s greatest alliance partner and (adding in investment) anointing the US  as Oz’s greatest economic partner, trumping China . China: From the Hong Kong negotiations, Thatcher saw China as ‘an intransigent and overwhelmingly superior power’. A sense of China’s innate superiority jostles with vulnerability and past humiliation: ‘How to assess, predict and influence this new would-be superpower of bloody lineage and uncertain intentions. … The history of China in the 20th century is, after all, a series of attempts to break with the past … But change is often more apparent than real. The modernisers in power always seem to be repeating, more or less consciously, episodes of the past’. And the pithy Thatcher depiction of China, ultimately, as a status quo power: ‘China today exports televisions not ideas’. The danger of diplomats and Foreign Affairs: Beware the diplomats who have a ‘reluctance to subordinate diplomatic tactics to the national interest and an insatiable appetite for nuances and conditions which can blur the clearest vision’. Policy making: The decisive influences in making policy can never be theoretical or technical but must be personal and political. And no amount of institutional neatness can resolve fundamental questions. There’s nothing like a good argument. Leader summits: ‘The underlying realities of power are not transformed by meetings and understandings between heads of government. … The twin, opposing, temptations of the statesman are hubris and timidity.’ Yet it’s still important to go and look another leader in the eye to find ‘…the personal chemistry which exists between those who conduct their nation’s affairs. I found myself liking and respecting – and sometimes heartily disliking and distrusting – heads of government not just as politicians but as people’. On summit consensus: Thatcher quotes a fellow leader at a Commonwealth summit commenting that consensus is what you get if you can’t get agreement. Her translation: ‘To me consensus seems to be the process of abandoning all beliefs, principles, values and policies in search of something in which no one believes, but to which no one objects’. Thatcherism is strong medicine that needs to be mediated by local conditions when applied in the antipodes. The classic example is John Howard, in his first term as Opposition Leader, visiting Mrs T in London when she had, as he writes, ‘reached the zenith of her power and influence among centre-right adherents around the world’. Howard returned with true-believer fire blazing in his belly, determined to fight for the Right in every sense; the Libs took fright and deposed him as leader and it was a long time before he got a rare second chance. As Mrs T advised when going up against the British miners, always be careful about how and when you pick your fights. Graeme Dobell is the ASPI journalism fellow. Image courtesy of Flickr user World Economic Forum .